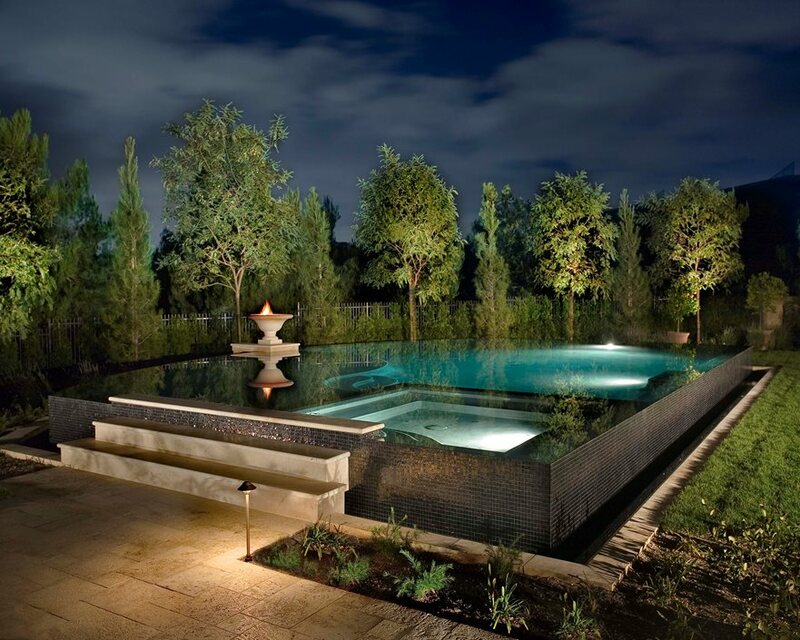 Cipriano Landscape Design of New Jersey demonstrates exactly why vanishing edge pools are so amazing for view lots. 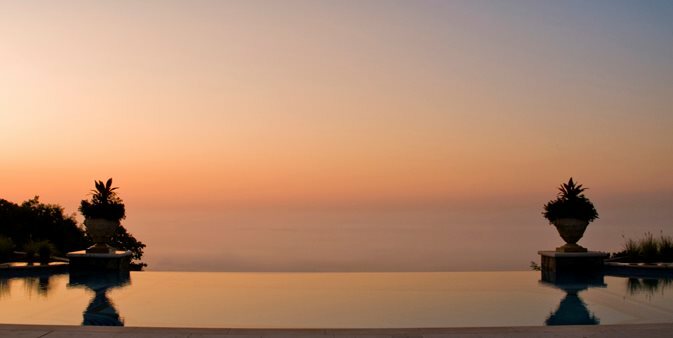 This view shows how subtle the line can be that divides water from sky. 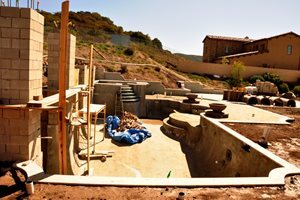 This pool by Alderete Pools in southern California features the newest vanishing edge technology for flat sites. The pool is elevated above grade so all four sides are rim overflow walls clad in glass tile. Note that the surface is continuous because the wall dividing spa and pool is fully submerged. This family pool demonstrates a vanishing edge, rock waterfall with grotto and a slide which appeals to the kids. After play hours the pool returns to its glassy surface to blend with the view for adult pleasures. This simple rectangular pool features a vanishing end that includes a rock wall waterfall. This design by Shades of Green in the San Francisco Bay Area shows how basic forms and clean decking are the trend for modern pool design. 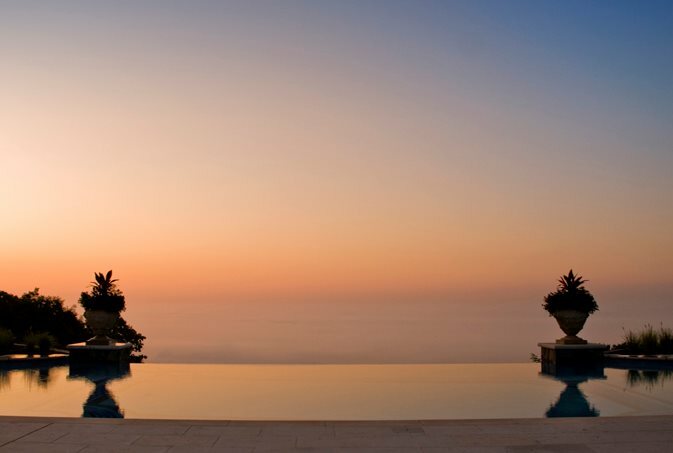 The infinity pool first appeared decades ago in luxury view homes with huge panoramas that can make ordinary pools seem small and more limited. The vanishing edge design eliminated any sign of pool wall on the far end so that the water surface visually blended into water and sky views beyond. This not only provided a truly exciting swimming experience, it made these often small view yards seem a lot larger than they actually are. A vanishing edge pool depends on precise water levels to maintain the perfect effect over time. This ensures a thin sheet of water flows over an edge as little as a quarter inch below the water line. From there it is captured by a linear gutter that drains to a pump that returns the water to the pool. The gutter is well below the edge making it invisible to swimmers and those on the adjacent decks. This is an expensive pool to build, and it can often require special structural calculations and reinforcement. 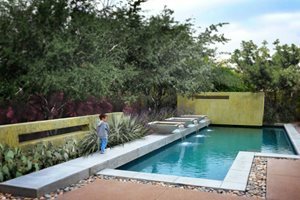 Many view lots are very small, and often the only way to build a good sized pool is to cantilever part of it beyond the edge of the ground plane. This means that part of the pool actually extends beyond the face of the down slope. Cantilever requires a tremendous amount of steel and structural engineering because both the pool and its contents can be surprisingly heavy. This is also one of the most expensive kinds of pools to build due to both additional labor and materials. "The current trend is toward vanishing edges," says Shea Alderete of southern California's luxury builder, Alderete Pools. "The modern zero edge is raised about 18 inches above grade and features 360 degree rim flow with ceramic glass tile. The water is so still it's like a mirror." This rimflow system was developed for rectangular pools of modern homes and dramatically simple contemporary design where a perfect sheet of water is desired for its highly reflective surface. 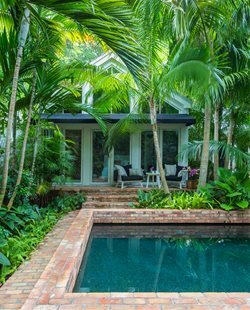 Unlike a vanishing edge which has one or possibly two walls that overflow, this perimeter overflow pool does so on all four sides. Without an edge to stop water movement, any disturbance on the surface is minimal, which is key to its mirror-like surface. 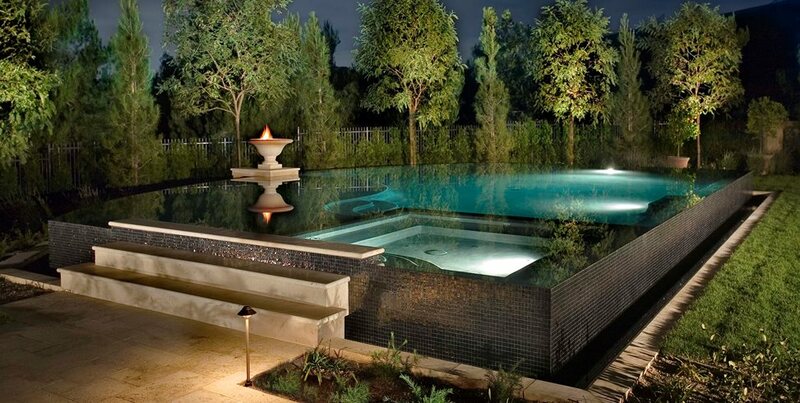 Perimeter overflow pools can be built in any kind of space and are less tied to view homes than vanishing edge. This pool's water line is well above the surrounding grade and caught by narrow gutters in the outside hidden by the pool deck which is often wood. This is why there is always a tiny gap around the bottom of the pool edge. Their simple form is architecturally powerful and the tile used to clad the overflow walls is a vital part of the overall design. This pool requires a highly trained specialty contractor due to the building tolerance of just 1/16th of an inch, which is essential to achieving the perfect effect. 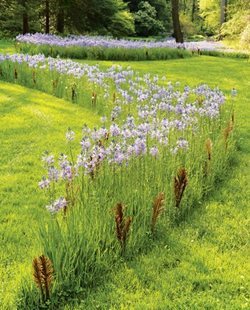 "We are getting more orders for perimeter overflow projects because it can turn a spa or pool into a piece of art," says Chris Cipriano of Cipriano Landscape design of New Jersey, who understands the engineering required to create this effect. "You have to have a surge tank which stores the water to allow for the overflow," which increases spatial and underground construction and cost.